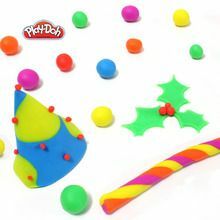 In this workshop we will have fun with the Play-doh "Advent Calendar". 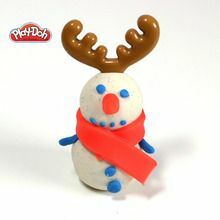 Every day, open a small box and find a new Play-Doh figure for some Christmas fun. We'll show you a few things you can do with these surprises! Content of the Play-doh "Advent Calendar"
24 surprises to discover every day! You'll find all the items mentioned below for your Advent calendar, as you look forward to the month ahead. Make two balls of white clay with glitter. One larger than the other. The smallest in the biggest Square. Make a small cone with red Play-doh. Place it over the smaller ball, for the carrot nose on the snowman. Make small blue balls for the eyes, mouth and buttons of the snowman. Roll small thin pieces of blue Play-doh for the arms and attach to the body. 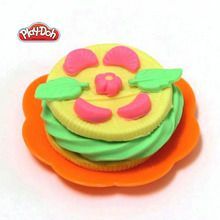 Cutting red strips with the Play-Doh knife. Place it around the snowman's neck. Cut the excess. You can add a head cover that you will find in the calendar in the morning! Flatten green play-doh while keeping a good thickness. Place small balls of clay in the small round cookie cutter Christmas tree shape. Use the cookie cutter on green dough. Carefully remove access around the tree. You can make a star with yellow modeling clay to add on top of your little Christmas tree. Make a ball of yellow dough. Then model the ball to give it the shape of a cube, by flattening on the sides. Cut two long thin strips. Place these two bands around the cube, like ribbon on a present! You can add a ribbon above the gift too. Flatten the dough with the green Play-Doh roll, keeping it a bit thick. Use the cookie cutter Christmas wreath shape to cut out the shape. Make some small balls of red clay to decorate the crown. Make a long thread of red clay and places it carefully around the crown. Cut it and attache it. You can add a little bow of clay at the top by sticking two small triangles on top of the wreth.